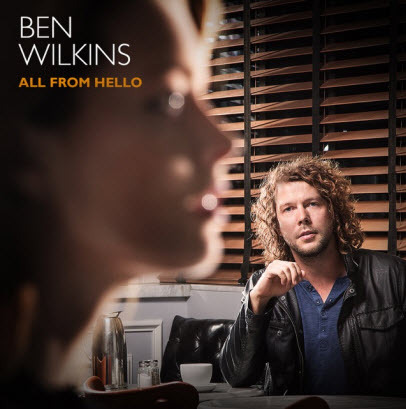 Listen to this track by singer-songwriter, multi-instrumentalist, and arranger and producer with an ear for detail Ben Wilkins. It’s “Day To Day”, a track as featured off of his newest record All From Hello, his follow up to 2011’s self-titled début. Like that début, this song and the rest of the record is lushly arranged with a slight nod to eras gone by. With this song, we get a special treat; none other than Bonnie Pointer formerly of The Pointer Sisters and a solo artist in her own right singing with Ben on a decidedly R&B-influenced song that shimmers with positivity. Mixed into that are hints of the shades of grey which can characterize the course of a life, with certainty and doubt constantly in flux; the pleasure and the pain from the heavens, yet falling down the drain, too. Ben recorded the new songs in his one-time base city of Montreal, embracing new textures, and yet with no less of an emphasis on intricate arrangements that hold a balance of their own; for all of their intricacy, they still allow the songs to breathe, and to get stuck in the heads of listeners. That’s always been one of Wilkins’ strengths. Yet this new record isn’t a case of more of the same. I got a chance to talk to Ben via email about the new record, the business of writing a follow-up, and about a shift in sonic vocabulary that involved analogue synthesizers and an archaeological expedition to the record store on the hunt for mythical 12-inch R&B singles. The Delete Bin: This new record was recorded in Montreal, but you’ve since made a move to Los Angeles, and you now head up your own record label Midnight Train Records, too. How do these new aspects of your career add dimension to your work when it comes to making records and touring? Ben Wilkins: What a great question. There are advantages to being with and without a label. I don’t like to wait after people so it’s good for me to be able to call the shots. It’s not something that really comes into the music. I write what I dream up and rehearse my band regardless of who the label is. It’s an added freedom and responsibility, and more busy work but hey, it’s just gotta get done. Musicians get stuck in contracts all the time and it can be really bad for morale. I’m enjoying my newfound freedom. DB: All From Hello is a follow up album to your début, which means that comparisons are likely. What were the avenues that you felt you had to explore, or to completely avoid in order to find the voice of the new record? BW: Musicians keep growing if they keep working. It wasn’t really a challenge to create a record with a new identity. It all sounded different right from our pre-production rehearsals. The musicians I had been touring with were different, I was different and the songs were different. And actually the album had an identity of its own before we went into the studio. We rehearsed pretty intensely as a trio (myself and Alex Lefaivre on bass, William Côté on drums) that winter and actually had the album song order before we did our six days of tracking. So after those first six days we sat and listened to the record cover to cover. It was a much more stripped down version, but it was there. DB: That lushness in arrangement that your first record is known for is still in place here. But, there is a definite embrace of analogue synths on many of the songs. What musical inspirations did you draw from to lead you down that path? BW: That was a pretty organic change. In the months before we went into the studio I would often spend free time digging through record bins at Death of Vinyl, a great record shop in Montreal. I got really into 12-inch recordings. Specifically seventies and eighties R&B and disco. I discovered a lot of music that wasn’t online. I also probably bought everything Nile Rodgers ever did and studied his production like a good pupil. There are a few people I regularly compare musical notes with in terms of what we’re listening to and Pascal Shefteshy (producer, engineer and mixer) and I are almost always on the same kind of trip. We got really into those records and then got really into playing with synthesizers. There’s a moment in “Deflecting Light” that just simply would not have happened if not for the Yamaha CS-50. Or the ARP Odyssey in “Day to Day Feat. Bonnie Pointer”. And the second part of “A Whisper” has some synth heavy moments that I’m particularly proud of. DB: Let’s talk about one of the obvious highlights when it comes to “Day To Day” in particular; Bonnie Pointer. It must have been a thrill to work with her. How did that come about? BW: That was an amazing experience. I knew I needed a special voice on that record and Bonnie Pointer was my first choice. The song takes a lot of inspiration from her song “Free Me From My Freedom”. So armed with all kinds of blind audacity, I found Ms. Pointer’s manager online and asked if she’d be interested. She said “Send over the track, if she likes it she’ll probably do it.” They got back to me a couple days later and we set up a recording date in New York. I actually had a show the night before and ended up driving all night with Pascal to make it to the session. She was brilliant. She’s beautiful and energetic with so much talent. And she has that kind of charisma that makes her a natural star. DB: There’s a decided R&B feel on a lot of the songs on the new record, but “Day To Day” is almost like a gospel tune, rife with spiritual imagery of “water from the heavens”, “like fires in the rain”, “a light in your heart”. When it came to arranging it, what were some of your starting points in deciding how to present it as a recording? BW: I had the chord progression at the chorus for a couple years. I would just play it as block chords but didn’t know what to do with it. Then it all just sort of happened. I’d been going through a lot of hardship in my personal relationships and was really just so appreciative of the people I still had in my life. This song came all at once like a mantra. Like an age old truth you’d hear someone tell you at a gas station in the south. And when it hit that spot then it had to go part gospel part funky country. I didn’t really think too much about how to present it as a recording, it was just this monster that came to be. DB: I love the way the vocals are so tightly interwoven in the chorus, and the way that your voice and Bonnie’s voice are so different in the verses, and yet they both suit the material so well. Tell me about how the vocals in particular were arranged and recorded. BW: Haha. These vocal parts haunt me to this day. They’re really difficult to sing and we do it live so it’s always a focus in rehearsals. I initially arranged the harmony during the 6 days of tracking with the trio and then started adding singers later to replace various parts. Each singer sings two or three of the harmony parts. They were kind of stacked like that. We just drilled it till it felt right. DB: There are some really interesting contrasts on this song created by using a variety of instruments; piano, bass synth, flute, and lots of percussion. What is the stringed instrument that takes a solo – is that a banjo? BW: Yes it is a banjo! A funky banjo, in fact. Bonnie Pointer’s track “Free Me From My Freedom” has an amazing banjo solo played by Eddie Hazel that I really love. So I called Joe Grass and we jammed. I played the ARP Oddysey. That day was tons of fun. We really threw some paint on the wall. DB: When it comes to deciding on instrumentation what’s your process in choosing which textures make the cut in the arrangement? BW: Sometimes I know exactly what the arrangement will be from the moment I write the song. But generally it all stems from the rhythm section. After we record as a trio I do what I like to call an album grocery list. We listen through and I imagine other instruments and textures and make a list of ideas. Then I go off and write parts for a while and when I come back to the studio we get cookin’. When something gets cut it’s usually because it’s stands out or clashes with another part or it is redundant. A good test is to just mute the track. If nothing significant happens or it’s better without then I’ve gotta let it go – no matter how much I liked it. Arranging is so much fun but its purpose is simply to serve the song. DB: When and where can audiences expect to hear the new songs in a live setting? BW: I’m playing an album launch show this March 31st 2015 at The Hotel Cafe in Los Angeles. Canadian tour dates will be announced soon. For more information about Ben Wilkins, check out benwilkinsmusic.com. And for an encore, check out this video taken at Pierre Marchand’s studio of another track from the new album, “Breakfast At The Figaro” by Ben Wilkins. The new album is out tomorrow, March 31, 2015. Look for it in iTunes, Amazon, and your local stores. Thanks to Midnight Train Records for passing along a copy of the new record.